On Thursday Donald Trump caused outrage by withdrawing the United States from the Paris climate agreement, something widely derided by politicians and the media globally as a retrograde step that literally risks the future health of our planet. Quieter voices, however, suggest that the decision is not the great disaster being lamented round the world, but a sensible response to an unworkable arrangement, and one that is likely to have minimal overall impact. The Paris climate agreement has been described as the most expensive global agreement in history: studies suggest that the annual cost could amount to between US$1 – 2 trillion per year by 2030, with a significant portion of these costs falling on the US, so it is un-surprising that a new US president elected on an “America first” premise is looking to reduce this burden. To recap, the Paris climate agreement was a commitment, initially by the by 55 countries that account for at least 55% of global emissions and later ratified by other countries, to limit global warming to well below 2oC and to reach peak emissions “as soon as possible”. “The Paris Agreement, in seeking to strengthen the global response to climate change, reaffirms the goal of limiting global temperature increase to well below 2 degrees Celsius, while pursuing efforts to limit the increase to 1.5 degrees. The agreement is voluntary, with no penalties for non-compliance, and relies on richer countries, providing US$100 billion a year in aid by 2020 to the poorer countries, with the amount rising thereafter. 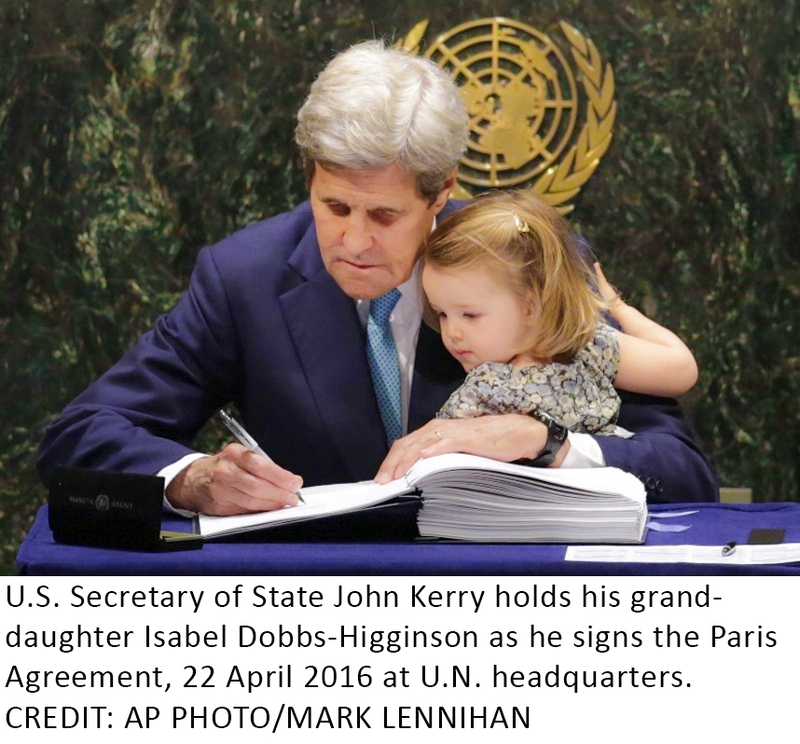 Is the Paris agreement realistic? that like it or not the only proven large-scale technology that offers potential for significant emissions reductions is nuclear. Review climate model projections and the validity of the 2oC threshold to obtain a better idea of the true magnitude of the climate change “threat”. Reset emissions reduction goals to a) what can reasonably be achieved and b) with the emphasis on nuclear. I have written frequently about the impact of poorly constructed climate policies. In Germany we have seen a rapid expansion in renewable generation driving record household electricity prices and cause major grid disruptions to neighbouring countries, while failing to actually reduce emissions. In Australia we see how poor integration of intermittent generation is threatening blackouts while also driving high costs and threatening jobs as lack of reliable baseload supply deters industrial investment. In the UK we have ongoing headaches over high retail prices, caused in part by the high costs of climate policy. Billions are being spent on de-carbonisation schemes yet global carbon emissions continue to increase, albeit at a slower rate, while the pursuit of biofuels damages biodiversity and in some cases food supply, and rare mineral extraction for batteries and other components causes localised pollution and environmental contamination. As former UK Chancellor and climate sceptic, Nigel Lawson says, governments and policymakers have been intimidated by a highly vocal environmental lobby into pursuing these expensive and often unsuccessful de-carbonisation policies (high penetration of renewables should not in itself be a policy objective for example), and would do better to focus their efforts on tackling issues such as particulate pollution which have more immediate and incontrovertible health impacts. This would favour replacement of dirty coal with cleaner gas and nuclear, and provide a secure energy system less reliant on expensive subsidy regimes (although some subsidies are still likely to be needed for nuclear power be it traditional large generation units or SMRs). And in terms of the US exiting the Paris agreement – US emissions have fallen from their peak in 2007, and are likely to continue to fall as cheap domestic gas is displacing coal in the generation mix. Withdrawal from a loose agreement with unrealistic aims is quite literally not the end of the world. Renewable energy: Expensive solutions that don’t work to a problem that doesn’t exist instituted by self legalising protection rackets that don’t protect, masquerading as public servants who don’t serve the public. I finally got it all into one sentence! Leo, I fully agree with your sentiments about Renewable energy. However we now need to ask the psychologists why this unscientific meme has taken such hold and find out if there is a hidden agenda behind using the public purse in such a profligate way. I agree – I find it hard to believe how enmeshed these beliefs are given the absence of true scientific process in the development of this agenda. I suspect that part of the problem is that there are few true scientists deciding or advising on policy and the type of critical thinking employed by scientists is often absent in education more broadly. I think it’s a product of the way in which our society sees science as “hard” and holds non-scientists in generally higher esteem….it’s seen as normal and even good to be “rubbish with numbers” whereas not being able to read is considered shameful.